This is like no other calcium supplement product out there! No more worrying about under or over dosing your pets with water additives. Human-grade, FDA regulated facility and packaging, crushed, not powdered. This is pure, sanitized eggshell, each batch tested and passing with a Certificate of Analysis. Hatched! 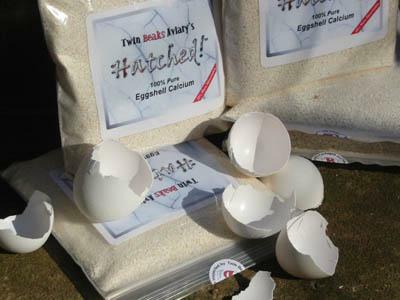 eggshell is a premium, ultra-pure, 100% natural source of calcium. It is 20% more absorbable than other forms of calcium carbonate. Hatched! eggshell is manufactured using a patented, chemical-free separation process in a U.S. FDA regulated facility. It is packaged using FDA approved materials. Hatched! Eggshell is human-grade, sanitized, pesticide-free and contains no preservatives. Hatched! eggshells support egg shell production, bone formation, blood clotting and heart, muscle and nerve function. Hatched! eggshell is enjoyed by Sugar Gliders, Rabbits, Chinchillas, Guinea Pigs and Hamsters. My Lady Gouldian Finches love this stuff! Feeding Suggestions: Feed as a stand alone in its own dish, free choice. Herb Salad & Hatched! Complement each other well and can be served mixed, in the same dish! This product is repackaged here by me from Bulk for the savings.